This article has been published here with the express permission of ( Rich ). 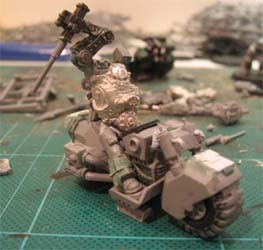 When the new SM codex was released there was a lot talk of how powerful a Techmarine on a bike would be. I don't play the game but thought it would look cool. So I've started one and will keep updating this thread with my progress and pictures. What I want to do is to model a Techmarine who fits the look of the current crop of techpreists, using the torso of one of the metal ones and falling back on converting the rest. I used the boxed set Techmarine because wearing a helmet on a bike in a war zone just makes so much good sense. Step 1 - This is still very WIP at the moment and held together with a lot of BluTac. Please ignore the old bike in this picture it was just being used to hold the rider as the actual bike is , at the moment has the front fork cut off and very little of the work I want to do to it done. 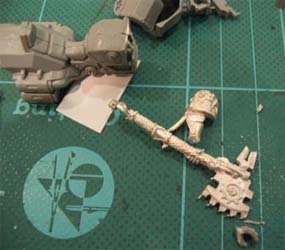 Step 2 - In his right hand I want to have a techpriest axe. I considered going the easy way and using the old command squad techpriest arm but the new axes are so much better so went for the chunky mail order techpriest axe, I like the square shape. This picture just shows the components I will be using in it, but I need to get the riders pose complete before putting this arm together to get a suitable angle. I wanted to do some work on the bikes engine this is a bit of it in progress cutting out one side of the engine block and sculpting in a heat sink into the hole. I thought a techpriest riding a bike with an experimental plasma engine would be damn cool. I have now sculpted in the heat sink and made some changes to the pipes underneath the engine block here to make it look less like a conventional engine. The marine will be slightly turning the handle bars as if he is steering at a slow speed which there isn't much to show of at the moment rather than a cut up bike. 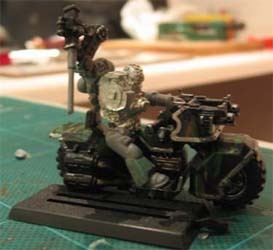 I also intend to add all the sort of quasi-religious technical components all over the bike as well as AM symbols so it fits with the ornamentation of the rider as well as AM fluff as well as a large onboard computer over the fuel tank probably with the Techmarine wired into it himself. 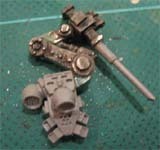 I will also sculpt the layered armour sections on the new Techmarine minis onto the bike of course. Step 5 - Techmarines on bikes can't wear servo harnesses which meant a servo arm. In the concept sketches for the new marines there was a picture of a solder welder, I thought that would make enough of a change for the marine. 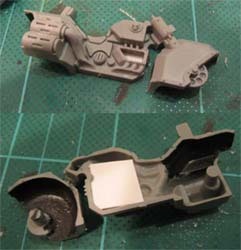 There will be a more standard claw arm (from the servo harness) stowed on the side of the bike to make it appear that the tools are hot swappable. I did a fair amount of cutting and pinning to put the servo arm onto one of the new backpacks rather than the smaller, nasty 2nd edition one that the servo arm is on. I also wanted it to appear as if the arm is inactive while the bike is in motion. Why it's compressed down rather than the normal uplifted pose of servo arms. I was going to sculpt the cog tooth layers on the legs as well as repeating that same layered pattern on the bikes armour. I was thinking of the computer interfaces being sockets tubal - he gets on the bike an plugs a mechandrite sort of thing in to fully interface with his bike - when he gets off he just unplugs it. 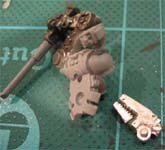 Step 3 - This is the beginning of the bulking out and squaring up of the Techmarines legs. 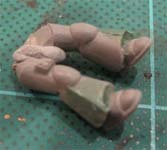 They are just the vanilla bike rider legs but I will sculpt on the layered armour of the new Techmarines on their legs. be generated I guessed and I have built in devices in their place that will eventually have connectors and cabling on for to provide a power source to other vehicle the marine is fixing. camera device - the whole arm is meant to be powered down as it is traveling. The other clamp head there is the beginnings of the extra servo arm head which will be stowed on the bike - I cut it up to appear closed for storage, it will have the top part of a servo arm built in and strapped to the back of the bike. Step 6 - Well, I've made a bit more progress on it now. This is it roughly assembled at present - though some things just couldn't go on and the rider is still barely started until the layered armour on the legs is finished, which is a slow job waiting for green stuff to dry.